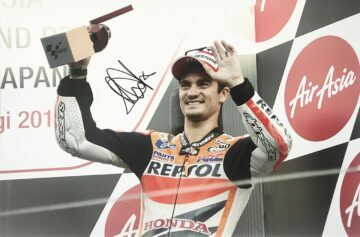 Shop our Dani Pedrosa signed memorabilia featuring autographs from the great Spanish Moto GP champion. 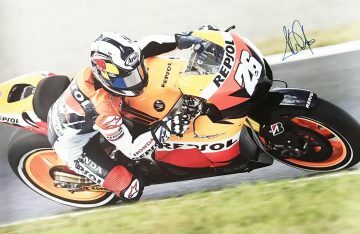 Signed Dani Pedrosa shirts, photographs & caps. All with a Certificate of Authenticity, fast international shipping, free UK delivery – many with signing proof. 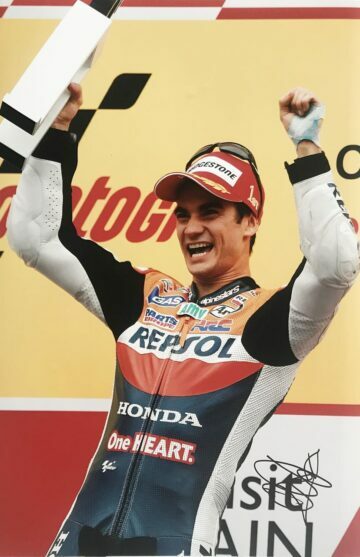 Small in size – big on achievement – now-retired Spanish Moto GP star Dani Pedrosa was a force to be reckoned with in the world of motorcycle racing and made an inspiring impact on the sport – especially in Moto GP. He started racing at the tender age of four on his first motorcycle, an Italjet50 with side wheels. He soon progressed to a minibike Kawasaki replica – and by age nine he had entered the Spanish Minibike Championship, finishing in second place. 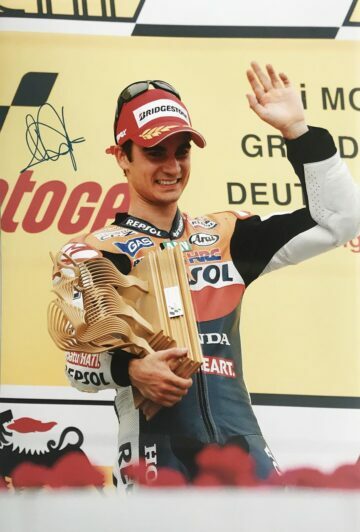 Following his debut Pedrosa moved to 125cc and soon progressed to 250cc, moving up to Moto GP class in 2004. As he made his debut he came up against fierce criticism from commentators and fans, who said his small stature wasn’t strong enough to handle a heavy Moto GP bike, and wouldn’t likely be a worthy competitor in the premier class. They were wrong. 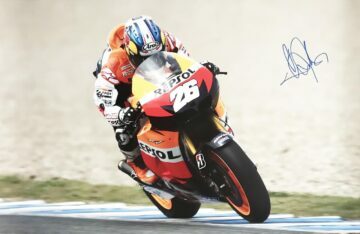 Despite having only handled a 250cc bike in the past, Pedrosa took to the 990cc Repsol Honda bike well, proving his critics wrong as he claimed second place in the opening round at Jerez in March 2006. In just four appearances he had won his first race, making him the second youngest winner (alongside Norick Abe) in the premier class at the time. 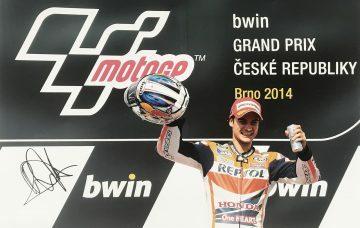 Since then Pedrosa continued to build on his early success, winning races in twelve consecutive seasons in the championship. Although the Moto GP World Champion title has eluded him, he finished as a championship runner-up on three occasions. His victories were all the more remarkable given the doubts and negativity that once surrounded him – and the many injuries he suffered throughout his career. Now retired, he will work with the KTM MotoGP development team as a test rider. 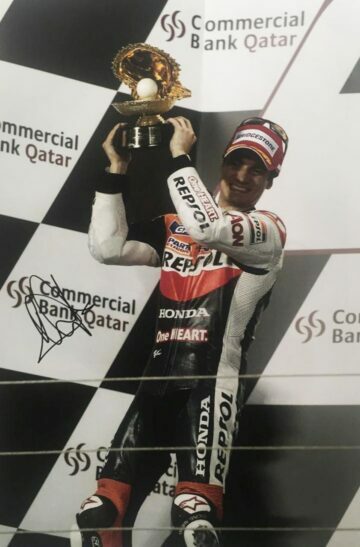 Dani Pedrosa signed Moto GP memorabilia is hot property – and here at Firma Stella we stock a fantastic selection of autographed ephemera. 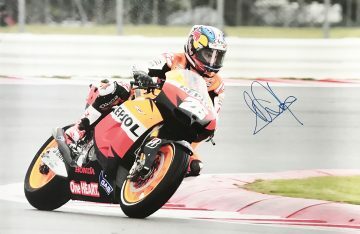 Each item is supplied with a certificate of authenticity, all are signed by Dani Pedrosa himself.